I'm back to work tomorrow, ready to launch into 2010 with great enthusiasm. I'm looking forward to this coming year, as it's going to force my team and I to be innovative, resourceful and creative - all good things. Twelve months from now as we finish 2010 and move into 2011 I want Outdoors Ireland to be positioned as the number one adventure provider in the south west of Ireland. On behalf of myself and my team; including Ferghal, Darragh, Dave and Ruth; I wish you the very best of luck in 2010 and really look forward to meeting you and working with you soon. Eric from Discover Ireland Tours sent me this amazing photo from Carrauntoohil's summit. Long may these beautiful hill walking conditions last! On Sunday morning, our frozen breath hanging in the air, Philip, Charlie and myself walked into the very back of Coomloughra Glen, where we had hoped to climb a steep gully which cuts across the north face of Caher. Although the gully was too slippery and wet, we had a fantastic day exploring this undiscovered north face, before cresting out just below the summit of Caher. As Christmas ticks ever closer, whether you're in the festive spirit, or not, have you thought about doing something different and adventurous over your holidays? 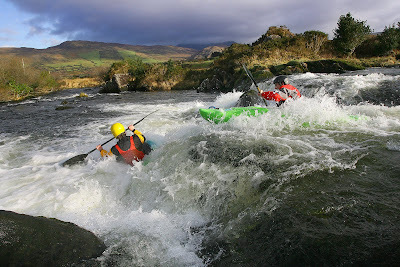 With transport and all equipment provided outdoor adventure company, Outdoors Ireland, based in Killarney, Kerry, are offering a choice of half-day and full-day trips in Kerry's outdoors from Stephen's Day right through to New Year's Day. Suitable for all abilities, if you want to experience something different this Christmas, work off the turkey and mince pies, get a new perspective for 2010, or just meet like-minded people and have some fun and excitement - come and try it! Prices start from €50 per person, with a 20% discount for 4 or more people. Scrambling is a true form of mountaineering; tackling a mountain straight on, overcoming any obstacles, working as a team and using whatever techniques and equipment are needed to get you to the summit and back. It's also a grey area and potentially dangerous. Are you hill walking or are you rock climbing? If you slip how far will you fall? Should you be using a rope? Are you placing gear and pitching or are you moving together on a rope? In Ireland, especially Kerry and Cork, the rock is loose and fragile; not the kind of rock you want to be trusting if you do slip, yet sometimes that's all you have and you have to adopt a 'sure it's better than nothing' attitude, which is far from ideal. Over the coming weeks I'm going to add to this blog post dealing with some of the many considerations when scrambling. I'm not writing this as a manual to go into the mountains and try out for the first time, but rather as a backup resource if you've already done a Scrambling Course with us. What I'm writing about can't be properly absorbed from reading this, but needs to be absorbed through doing one of our training courses or going through an apprenticeship with experienced mountaineers. from your planned route, or look for different options, if you feel you're stepping out of your comfort zone, you're beginning to lose control of your situation, or the weather and mountain conditions are worsting. through asking local experienced mountaineers firstly, then check guide books and the internet. Find out where it starts and finishes, what the tricky sections are like, any major hazards and your location on the mountain when you reach the top of the scramble. on your approach walk as you'll probably have an overall birds-eye view of the mountainside. Use this time to look at different routes up your scramble, different ramps that you could link together, any areas to avoid. Look for the easiest and safest descent route, in case you need to make an emergency descent for some reason. the ground as you move across it. Are there loose pieces to avoid? Are there solid pieces to use? Does it look slippery? Most importantly look at the rocks you’re scrambling over. Even though they’re big or may look solid, how well are they connected to the mountainside? before you place your full body weight onto it. This will test for looseness and a solid kick will also bond your foot more securely to the ground. before you place your full body weight on it. This will test for looseness. You want to feel for any wobbles or vibrations and also look for any vibrations. should be made with the mountain if you’re scrambling steeply. You’ve four contact points altogether; two feet and two hands. Only move one contact point at a time, so if you slip you’ve three secure points holding you to the mountain. of a slip before you make each tricky move. Is the likelihood of slipping low, medium or high? Obviously the higher the likelihood of slipping, the more precautions you need to take. of a slip before you make each tricky move. Are the consequences of slipping low, medium or high? Low consequences being a slither down some scree or a banged knee and high consequences being a serious fall or falling backwards. Obviously the higher the likelihood of slipping, the more precautions you need to take. to make an informed and safe decision. If you’ve low likelihood of a slip combined with medium consequences then it's probably safe for you to do. If you’ve medium likelihood of a slip combined with medium or high consequences then it’s not safe for you to do. onto a handhold or foot placement because while that handhold may support your weight when used carefully; by shock loading it you put it under much more strain. using small steps and short reaches, to ensure you’re never off balance or throwing your weight onto anything. This is especially important when descending. with all party members, so if you touch a loose rock or step on a slippery slope, everyone else learns from your mistake and no-one else puts themselves at risk. that you can aim for, recover your breath, take a drink and re-assess your route. These aren’t things you want to be doing part way up a tricky section, where you will need full concentration on simply moving safely. something you can't safely scramble back down again. Before you climb up or across a step ensure you're happy to climb back down or across the same step, if you need to retrace your route. and look at the bigger picture if you begin to feel trapped or in danger. Often if you take a minute to look around you there is an easier, safer option nearby, that you just haven't spotted. if the route becomes complicated. Instead of the whole party wandering around on steep ground send two members slightly ahead to scout out if there's a safe route or not. need to be watched out for. There may only be a minor drop from the little ledge you're standing on, but is there a secondary drop slightly lower down that you may also tumble over, if you were to slip? need to also be watched out for. Look at what direction you would slip and by weaving through boulders try to put obstacles in the way of your fall direction. If you were to slip these obstacles will stop you from tumbling. and look for another option, take your time to scout ahead or even turn around and re-trace your steps back to your car if need be. The best and safest decision you'll ever make in the hills is to turn around! from yourself or from other party members. If you do ever feel under pressure or think you shouldn't really be in that situation, then find a safe haven, stop, relax for five mins, have a cup of tea or chocolate bar and carefully re-assess. You make much better decisions when you're warm and dry. Even more importantly you need to be fully hydrated and full of energy so drink and eat throughout your day. To that end use a platypus and fill your pockets with snacks. don't take chances. Stop, re-assess and if really necessary call for help. Don't take dangerous chances to get yourself out of difficulty. Are you sure you're really stuck though? Really think about the above two points. 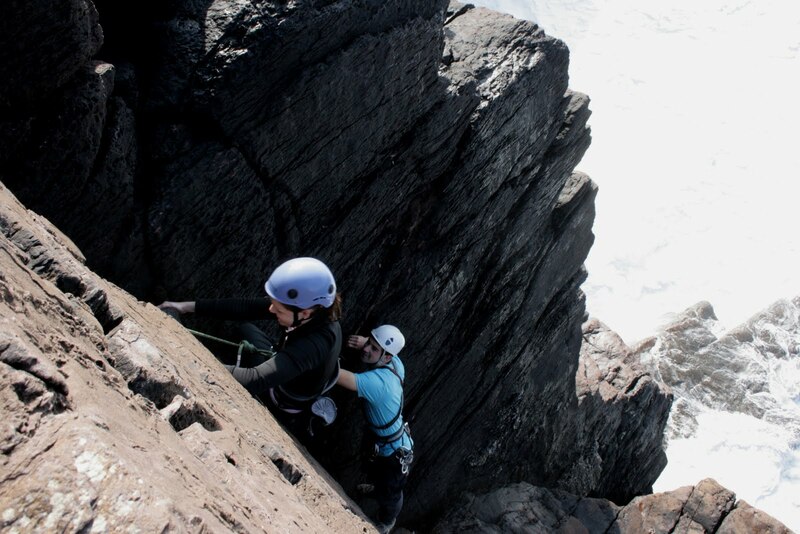 Click here to book onto a Scrambling Course! Have I missed out on anything? Just add in the comments section. Scrambling and Ropework on 'The Bone' yesterday on a fantastic winter's afternoon! After spending a very wet, very windy weekend running a Mountain Skills 2 for Doolin Coast Guard, followed by a very cold, windy two days running a Mountain Skills 1 for trainee instructors from Kinsale it got me thinking about the little tricks and tips I use for staying as comfortable as possible in bad conditions. Have a compact & tidy backpack, with no flapping straps. No backpack is waterproof so have a waterproof liner or thick bin bag to keep your bag's contents dry. Have the correct equipment to be prepared for most eventualities. Pack your backpack in the correct order of what you'll need over the day; so spare fleece on top, lunch in the middle & first aid kit at the bottom. That way you're not rummaging through your bag, in wind & rain, pulling things out to get to the bottom of your bag for something that you need. Before you leave your house in the morning fold your map to the area you're going to & have it already in a map case, if you use one. That way you're not on the side of a hill trying to fold a paper map in the wind. To stay dry you need your waterproofs zipped right up. To have them zipped right up you need to get your layers underneath right, so you don't overheat. You want to be a little chilly when you leave your car, as once you start moving you'll warm up. Have a chocolate bar or snack in one of your pockets so at any stage over the day you can have a quick snack without stopping. Also have map & compass in your pockets ready for use at any stage. You'll stay warmer over the day, especially when you stop, if you keep your layers tucked into your trousers & keep all of your zips, including pocket zips, zipped up. Control your body heat over the day by using these zips. It's a good idea as a general rule to always keep pockets zipped up, which prevents you ever loosing anything, such as phone, map or car keys. When you start your walk look ahead & if you think you'll need hat & gloves shortly put them in your pockets in advance so you don't need to stop & go into your backpack in 20 mins. Over the day do a steady & slow pace, which allows you to keep going all day with just a few short breaks. It also keeps your energy levels higher & lowers your rate of perspiration. The more you perspire the colder you'll be when you stop & the more energy your body uses to dry out your damp clothing. Keep your coat bottom, trouser ends and sleeve cuffs closed tightly to prevent wind & rain driving into them. When you do stop to eat and drink turn your back to the wind & rain. Try not to sit down or lean against rocks or hillside, as any contact your body has with the hillside is drawing your body heat outwards. Damp will also seep in through your waterproofs if you have contact with the ground or rocks. Also if you're wearing gloves avoid touching rocks as damp will seep in through your gloves. Neck gaiters are great for extra neck & face warmth. Do your best to keep your feet dry over the day, so even if your boots are very waterproof, avoid splashing through puddles & bog holes. Gaiters are useful for really wet days. If you wear gaiters pull your waterproof trousers over your gaiters. Don't put anything down as it can blow away so easily. If your map or gloves have just blown away then you could be in difficulty. Bring sunglasses or ski goggles, so if you have to look ahead & navigate through driving rain or hail, which can sometimes be painful, you can put on your sunglasses and navigate. These are things that we cover in Mountain Skills Courses. Click here to read more about these two-day courses. Dont be put off hill walking during the winter. Some of my best days in the mountains have been during winter time! Just be prepared. Sea Cliff Climbing on the Old Head of Kinsale. We had a little porpoise swimming along the cliff base in the afternoon and a whale surfaced way off in the distance. Throughout 2010 we'll be offering a multi-day adventure break designed for overseas tourists and American college students. The holiday will be based in the vibrant town of Killarney and will include transport, luxurious accommodation, delicious healthy food, adventure activities, outdoor equipment and qualified guides. This is a fabulous day in Kerry’s great outdoors. Beginning at 600 year old Ross Castle, perched on the shores of Lough Leane, local boatmen will help you into comfortable open boats for the trip through the three Lakes of Killarney. You’ll pass a solitary overgrown rock, called O Donohoe’s Prison. This is where the original castle owners, the O Donohoe Ross’s, chained their captives, to face exposure and hunger. As you pull out into the open waters of Lough Leane the ruined abbey of Innisfallen will pass on your starboard side. Originally a leper colony, it was also one of Europe’s first universities where several of Ireland’s high kings, including Brian Boru, spent time furthering their education. On at least two occasions the Abbey was attached by Vikings, who came up the Laune River from Killorglin. Keep a watchful eye on the dense woodland and thick rhododendrons that cover the flanks of Shehy Mountain, for a glimpse of soaring sea eagles. After the noisy excitement of the Meeting of the Waters you’ll chug through the secretive waters of the Long Range River. The shores alongside are plentiful with wild goats and red deer, though you may not see them! The final island, McCarthy’s Island, is told by some to be named after a neighbouring chieftain, who fled to the island while fatally injured during a midnight cattle raid. A welcome cup of tea or coffee awaits in the little coffee shop at Lord Brandon’s Cottage. The ivy encroached ruins of the Victorian hunting lodge still remain today. The Black Valley is an impressive glacial valley, ice-carved many centuries ago by vast glaciers scraping their way towards Killarney. The foothills of Ireland’s highest mountains and imposing views of the jagged MacGillycuddy Reeks lie before you; while the steep valley sides often run with swollen streams and cascades, rushing down to feed the Lakes of Killarney. A long climb leads to the high Head of the Gap, where the incredible Gap of Dunloe stretches before you. Purple Mountain and Tomies Mountain are on your right, named after the blooming purple heather which covers their slopes. Purple and Tomies makes a great hill walk for another day. The descent down through the Gap of Dunloe is a glorious and exhilarating ride as the wind whips past your face. The black mountain lakes look inviting on some days and cold and mysterious on others, their water levels fluctuating on nearly a daily basis. Sometimes mistaken for someone calling in distress you’ll usually hear the bleating of hardy mountain goats and their kids coming from overhead cliffs. As you pass the fifth and final lake keep your eyes open for rock climbers on the popular roadside cliff, Brennan’s Leap. You’ll often hear them before you see them, with the jingle of metal equipment and their shouted climbing calls. Kate Kearney’s Pub is a delightful sight at the end of the Gap, where tea and scones await. Discover the delights of the Old Kenmare Road, an ancient coaching road, now part of the Kerry Way. Hike through the oak woods of Killarney National Park, to finish at 18th century Muckross House and Gardens, with tea and cakes. The Kerry Way from Glencar to Glenbeigh is a beautiful hike. Start at the Climber’s Inn in Glencar and from here follow the sign-posted Kerry Way along wooded green lanes and later the high banks of the clear Caragh River. Looming in the distance is the Ballaghisheen Pass, named after Oisin from Tir na Og. At the crest of this mountain pass it’s told that Oisin fell from his horse, and perished as the 300 years of his departure from Ireland caught up with him. I think the best part of the hike is as the little trail leaves the Caragh and winds through thick dark pine woods for over three kilometres, crossing deep quiet streams and occasional fallen trees, their roots torn up into the sky. The final section of woodland hiking feels like a secretive mass path as the trail descends and ascends winding stone steps and ducks under overhanging branches. Emerging into the bright sunlight (or soft rain) of the open air, follow the Glencar road towards the base of Seefin. Here you’ll join a butter road which climbs steadily up to the Windy Gap. The narrow crest of the Windy Gap is a superb place to gaze back over the wooded and streamed landscape you’ve crossed and to look ahead over Dingle Bay, the beaches of Rossbeigh and Inch, Mount Brandon and the Blasket Islands. An hour’s descent from the Windy Gap takes you to Glenbeigh where the Towers Hotel offers welcome refreshments and on a wet day a warm open fire! Back on the main road detour to the sleep village of Portmagee. A must see is the Skellig Experience Centre, dedicated to the history and stories of the 6th century monastic settlement of Skellig Michael. Portmagee is named after an infamous pirate, Magee, who was shipwrecked on the coastline, met a local girl and settled down in the village to a life of married contentment and dangerous smuggling. The Bridge Bar serves delicious food and is a great lunch spot. On a fine day you can sit outside at the water's edge, watching the coming and goings of the brightly coloured fishing boats. From Portmagee follow the narrow road over the top of Coonanaspig Pass and down to Saint Finan's Bay. Here you can swim in the fresh crashing surf at the sandy beach and call into Skellig Chocolate Factory where you'll be rewarded with sensational smells and free samples of delicious chocolates. Continue to Derrynane Beach. Here long golden beaches, Daniel O Connell’s family home, wetsuit and snorkeling hire, sailing and windsurfing from Derrynane Sea Sports and the ruined abbey on Abbey Island are all calling to be explored. If you're into hiking, best of all, is a hidden mass path and secretive smugglers trail beginning at the pier and twisting along the side of Derrynane Harbour, through thick encroaching rhododendrons. Despite the weather we're still running kayak trips! I was recently asked to give a presentation by Failte Ireland about myself and Outdoors Ireland, which I set up four years ago. I thought I'd post it on our blog also, in case anyone was interested. I suppose the outdoors has always been my passion. 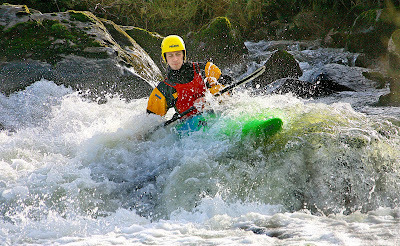 I remember saving pocket money to go kayaking at a water sport centre near Kenmare, eventually buying my own kayak when I was 12 or 13. At the age of 14 I was working my summer holidays for the same water sport centre, washing wetsuits and taking people kayaking. I left school early, signed up for an instructor training course at Kinsale, and it was there, really, that I decided to make a career in the outdoors. After finishing in Kinsale I worked throughout Ireland, including Cappanalea Outdoor Education Centre and also in the highlands of Scotland, near Aviemore. After working with public outdoor centres here, it was a great experience in Scotland to see how private companies operated, what they expected from their staff and what they delivered to their customers. Back in Ireland I then worked as a freelance instructor for a couple of years. I was very lucky that I got to work with some great companies like Tiglin, Go Ireland and Pat Falvey. I set Outdoors Ireland up at the start of ‘06. I didn’t really sit down and devise business plans and financial projections. My freelance work had slowly been overtaken by private work, so I began running more of my own courses, buying more kayaks and equipment and printing business cards. Then I just woke up one day and realised I had all this equipment and customer expectations. Once I realised I had an adventure business around me I decided to take it pretty seriously. ‘07 was a quick learning curve; going from teaching kayaking and guiding groups on Carrauntoohil to things like keeping databases and making expensive mistakes with advertising! ‘08 was a year of looking at more formal structures, looking at how to give our customers the best adventure experience they could possibly have and inspiring them to give us repeat business. For the last couple of years I've been involved with Failte Ireland, through their Adventure Hub Project and I've found them absolutely brilliant for their advice and innovation. ‘09 then has been a hectic year, dealing with the level of admin and current work, staying on top of our current marketing, constantly looking at new ways to develop. For the first three years customer numbers increased each year by 100%, This year customer numbers are only up by 15% - 30% depending on the activity, so although it's not as ideal as the first three years 2009 has been a positive year. 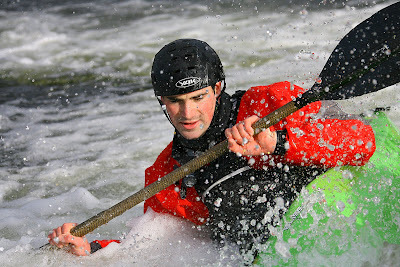 My vision is to provide the best training courses and most unique adventure breaks in Ireland. I want customers to have an amazing experience with us, from their initial enquiry, to their outdoor experience, to our follow-up with them afterwards. I want customers to return to us again and again, and to be our ambassadors, using their word of mouth to generate more business. Word of mouth and repeat business would account for a large part of our work. I went into 2009 very much focused on people. Making our customers feel special and appreciated. Also getting the best team of staff around me I could possibly get. People skills and professionalism are the most important things with my team, coupled with their knowledge and qualifications. With the corporate team building we run, generally if a company is having problems it’s because of a lack of proper face to face communication, so I took the mistakes the corporate companies have made and tried to apply them to ourselves. Making sure there’s clear communication between us and that my team understand the reasons for the small things around the edges. This year harder than ever we've looked at giving added value for money for all of our training courses, adventure trips and corporate team building. 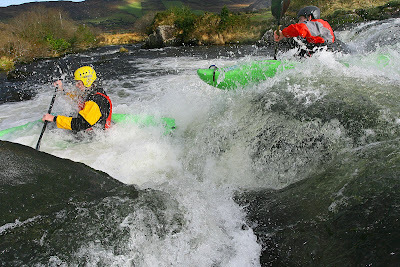 Failte Ireland’s Adventure Hub project I’ve found invaluable. Mainly for meeting and getting to know the marketing managers and people behind the hotels and guesthouses in Killarney and West Cork. I’ve found the accommodation providers involved with the Adventure Hub to be a great bunch of people, really pro-active and willing to give anything a try. My plan for 2010 is to take my vision of offering the best training courses, most unique adventure breaks and exceeding customer expectations and break them all down. It’s easy to say these things, but to continue to implement them will take a lot of hard work. I’m going to sit down with some of my team over the next month and work out how we’re physically going to achieve these things and set targets for ourselves. Things have gone well over the past four years; but apart from some hard work on my part it's mainly down to our brilliant repeat customers, my fantastic team of guides and instructors and advice from the likes of Vanessa & Roisin from Outsider Magazine and Josephine, Eithna & Siobhan from Failte Ireland. To all of them and everyone else who has contributed to Outdoors Ireland or listened to my ideas I'd like to say a huge thank you! It wouldn't have been possible without you guys. Every cloud has a silver lining! Because of the rain forecast this weekend we're planning two days of white water kayaking, if you're interested in signing up? Saturday is for complete beginners upwards, so it doesn't matter if you've never been in a kayak before. By the end of the day you'll be splashing down gentle rapids on the Laune! Sunday is for experienced paddlers & you'll be tackling one of Kerry's classic grade 2 rivers, either the Caragh or the Flesk. 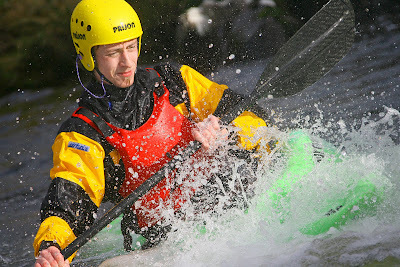 You can also do two days white water kayaking; learning strokes, techniques, communication methods & rescues, while having fun & staying warm! Well our first Singles Adventure Weekend is over. Everything went well, especially the weather, apart from the occasional downpour! We began on Friday evening with a night hike along the Kerry Way into Glenbeigh village. Saturday began bright and early with a delicious cooked breakfast and an exciting hill walk, where we experienced all four seasons, including blus skies and stunning views and also gale force winds! That evening we ran team challenges on Rossbeigh Beach, where everyone worked together in small teams to complete different challenges, some physical and some involving more clever thinking. That night was spent in the warmth of the Towers Hotel, over dinner and pints. Sunday was a busy day, alternating between kayaking on Lough Leane, rock climbing in the Gap of Dunloe, and even abseiling for some lucky people! After delicious hot soup in Kate Kearney's Pub for lunch we finished the day with tea and coffee in Killarney. Thanks everyone for a great weekend and for being such good fun! Our next weekend will be 27th & 28th February. 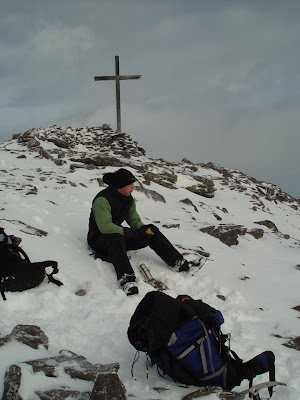 Climb Carrauntoohil, Ireland's highest mountain! Ascend through misty corries to stand on Ireland's highest peak, overlooking the Iveragh, Dingle & Beara peninsulas. With local experienced guides discover the area's legends & history. Kayak the deep waters of Lough Leane, overlooked by Ross Castle and Killarney National Park. Wrapped in warm wetsuits, explore the sheltered lake shore & thickly wooded islands. Climb through glaciated corries, past deep mountain lakes and along ice-carved ridges to stand on Carrauntoohil's lofty cloud-strewn summit! Discover the fun & excitement of rock climbing in the ice-carved, impressive Gap of Dunloe, in the company of qualified instructors. Hike the rugged & beautiful Kerry Way, through the silence of the Black Valley & the glaciated Gap of Dunloe, to finish at Kate Kearney's Pub with a hot drink. Climb the high, impressive peak of Mullaghanattin, standing at 776 metres above sea level, deep in Glencar valley, overlooking the three peninsulas. Discover the delights of the peaceful, spectacular glaciated Coomasaharn Horseshoe, with it's deep lakes and sheer cliffs. Hike along the very edge of Dingle Bay, overlooking the Atlantic Ocean. Climb past ruined famine cottages to the peak of Knocknadobar, then descend an ancient trail past Glendalough Lakes. 10% Discount for 4 or more people! Looking for accommodation in Killarney over Christmas? It all began in January 2004 when the Irish Charr Conservation Group discovered some strange results from their echo sounder read-outs in Muckross Lake. They were surveying fish-life in Kerry's ice age lakes when their hyroaccoustic equipment stumbled across an 80 metre long object. ''We have been unable to identify what exactly the image is, but we know that it is not a computer or logging error as the gear was functioning normally'' said Andrew Long, specialist fisheries consultant with River Monitoring Technology. A dubious photo, taken in 1981, exists which shows an object rising out of the water. I have my doubts as to how genuine this image is, but click here to see the photo and scroll down the page. Going further back in time, many Irish legends exist in the Killarney and the MacGillycuddy Reeks referring to a Piastha, Worm, or Serpent. In fact one of the lakes high in the impressive Black Valley is told to have been formed by a great serpent; while in the MacGillycuddy Reeks one of the peaks is called 'Cnoc na Peiste' (Peak of the Serpent). September of this year saw some video footage recorded of strange happenings in the edge of Muckross Lake, which can't be fully explained. See the below video. Some scientists believe it may be a giant 20 metre white eel, grown to a monstrous size by the plentiful food supply and warm murky waters; others believe it may be an ancient pre-historic creature. Until we know more it's advisable that you don't go onto the Lakes of Killarney, especially Muckross Lake, by yourself. Avoid walking too near the water's edge, where the ground drops steeply into deep water. With the darkening evenings if you walk in the National Park, let someone know where you're going. Carry a torch as bright light should dazzle any creature you may stumble upon and may give you an opportunity to escape. If you do encounter any creature run as fast as you can! If you have any more facts please leave a comment here. This October Bank Holiday Weekend we hiked through the isolated and rocky Horse's Glen under the cliffs of Mangerton Mountain; we climbed Carrauntoohil, ascending O'Shea's Gully and descending Heavenly Gates; and we did a refreshing kayak trip on Lough Leane into some of the limestone caves. Some last minute places this coming week if you fancy doing something outdoors and adventurous with myself and Ferghal. The coming week looks like lovely autumn weather, with mild temperatures, warm south westerly breezes, cool autumn rain showers & brilliant golden colours spreading through the hills and woods. Learn strokes, techniques, rescues & safety awareness needed to kayak safely as part of a group on flat water, plus enjoy the spectacular autumn views of Killarney National Park. 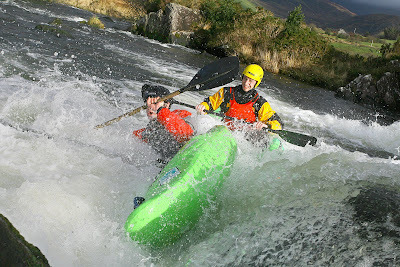 Excitement, adrenaline and training for white water kayaking on either the Caragh or Flesk River. I'm looking for single men! Here I am though, with the Singles Adventure Weekend fully booked with females, but still needing a few more males. We've committed to having a 50/50 split of guys and girls for the weekend and we're going to make sure that it happens. There will be approx 24 people altogether taking part in the weekend, which will include hill walking, kayaking, rock climbing and relaxing over a pint and great food in Glenbeigh village, on the weekend of 31st Oct & 1st Nov. So if you know any single men out there who may be interested in this weekend get in touch! When I choose my team, experience and qualifications are important. More importantly however are team qualities and communication skills. A team without team work; I often imagine as a football team who's members run at break-neck speed towards their opponent's goal, sometimes breaking through the opposition to score, due to their own strengths and individual skills; but many times failing and wasting opportunities. Take those same members and inspire them to support and encourage each other, communicate with each other and pass the ball between each other. Take each player's individual strengths and skills; blend them and focus them, not on scoring goals, but on performing as a highly tuned team and the results will follow. This year I think businesses and companies battened down their hatches, payed their bills and dealt with daily work. I can identify with that myself, even though this year has been our busiest year over the past four. 2010 will be a tougher year, with less money in our pockets, according to some. Others say the worst is over. Who knows? What I do know is that for a company or team to develop and thrive 2010 will be a year when everyone needs to Stop, Look and Listen. Team Work and Clear Communication are going to be two of the keys to a company, not only surviving, but also thriving. This applies to every organisation from an I.T. company of two hundred to a contractor with three part-time staff. Stop your ceaseless hard work, phone calls, emails and meetings for a day. Look outside your organisation, at the opportunities that are available and the chances that should be taken. To some extent look at what your industry leaders are doing, but better still look at what you can do to become your industry leader. What's no longer worth doing? Are the best people in the best roles in the best teams? How can we empower people within teams to perform at their best? How can we empower teams to perform at their best? Listen to your customers and team. My best ideas come from my customers. My best plans are made with my team. Team Work and Communication are such vital and powerful building blocks that with a good team around me I feel anything is possible! Team Building programmes come in many different forms, from a one-day course to a five-day course, designed around each specific team's objectives. They're geared for all abilities and set in an outdoor environment, involving projects designed to raise learning points, bring simmering conflicts and issues to the surface or empower a team to perform to their maximum. Regular open discussions and debriefs happen in an informal way, with the team very much bringing up their own learning points and issues. For me, the enjoyment of running team building courses, comes from working with a group of people who's priority is working as a team. We focus on working as a team, we become a team, we produce results, our customers are happy. If you're interested in more team building details, or would like to discuss options contact Nathan on info@outdoorsireland.com or +353 (0) 86 860 45 63. Feel free to leave your own thoughts and comments.